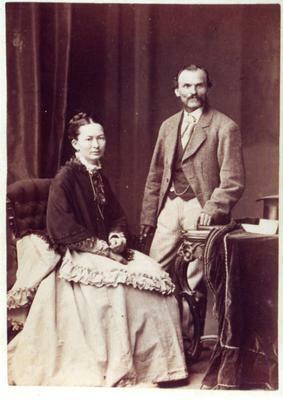 Studio portrait photograph showing Augustus Barrett and his wife Sarah. Augustus Barrett was born in Germany in 1830. He married Sarah Ann Edwards and they had two children. Augustus opened his photography studio in Whitby in 1872 and operated a studio and gallery until 1884. He later opened a studio in Toronto and died in 1902. Sarah died in 1919. They are buried in Mount Pleasant Cemetery.